The buildings and trees were the easiest part of this painting. It was clear that the light was coming from the left and shadows were on the right. I decided that I had the sunset too far behind the buildings. You can see in the following photos that I brought the sunset colors in the sky further to the left so that the light was glowing on the left sides of the buildings and rocks. Rocks, and sky, and water. Bringing them all together along with the light on the buildings. 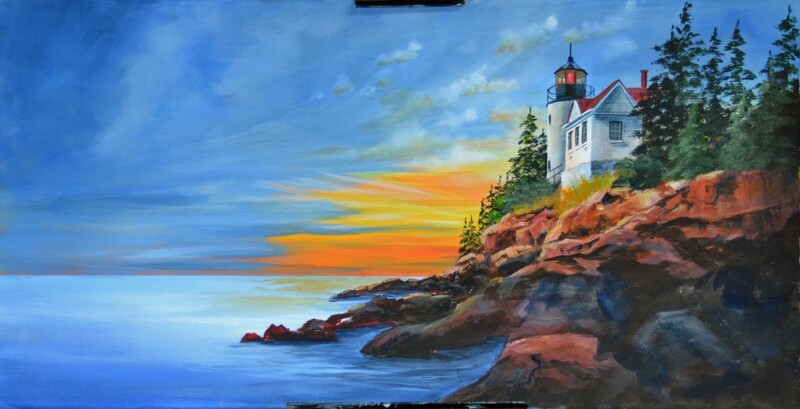 What do you see in my painting that needs adjusting to create the late day, sunset time? And then what do you see that I have changed? I’ve toned down the distracting rock in the foreground. And added final lights to the rocks at the bottom of the light house. Notice the white in the sunset and the lights added to the water as reflection. Then the shadows behind the rocks in the water. 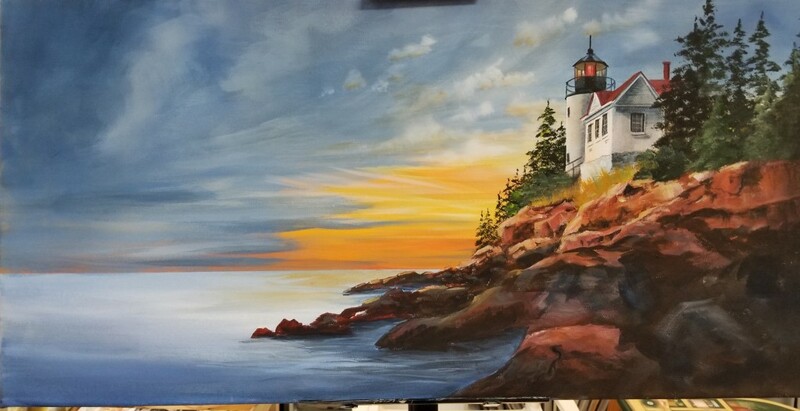 If was such a learning experience to work on this painting and exciting to think and paint through the story of the Bass Harbor Light at sunset. I hope this series has been helpful in seeing my process and progress through painting the light. DecoArt Traditions paints were used. Reproduction of the contents of this web site, including images, is strictly prohibited without the permission of Liz Miller CDA. Any unauthorized use will be prosecuted to the fullest extent of the law. Copyright Liz Miller CDA. Thurs-Sat when classes are scheduled. Ros Will Be At Artful Endeavors Soon! All images contained in this site are copyright protected. Any use is strictly prohibited without written authorization from Liz Miller CDA. Artful Endeavors | Powered by Mantra & WordPress.